As the hub of a fledgling British Empire, London around 1710 was burgeoning with new wealth and offered the perfect setting for operatic entrepreneurs eager to spread the latest Italian fashions. It was thus a city of opportunity for Handel, fresh from spending five years in Italy, but also for many other touring musicians including Arcangelo Corelli, Francesco Maria Veracini and Francesco Geminiani. This recording unveils a portrait of the chameleon Handel, emerging in the panache of his early Italian-styled Amadigi, reaching maturity in the ‘English operatic’ Hercules and arriving finally in the perennial melodic grace of Theodora, his penultimate oratorio. Extracts from these works, in which the young Norwegian mezzo-soprano Tuva Semmingsen displays both vocal agility and a wide-ranging emotional palette, are interspersed with instrumental works by Handel’s Italian contemporaries. 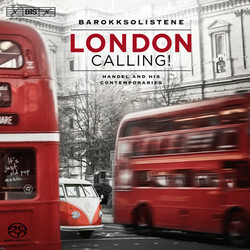 Corelli’s Concerto grosso in D major, from the celebrated Opus 6, and Geminiani’s ‘La Follia’ in D minor – incidentally a reworking of Corelli’s famous violin sonata – both illustrate Italian instrumental music at its most sumptuous, in colourful and dynamic performances by the Norwegian period band Barokksolistene. For further variety, the leader and artistic director of the ensemble, Bjarte Eike, also performs a chamber work by Veracini, who visited London regularly during some three decades in the early 18th century. The Sonata in A major was published in England in 1744, and it would be quite tempting to interpret the use in it of a Scottish tune, Tweed’s side, as merely a clever marketing device to charm a local audience, were it not that the tune, and the composition itself, was so attractive.